This is the last day of mana week, but I won't be talking about mana today. Soon, I'll be leaving for Japan to attend Pro Tour Nagoya, and I'll be out of the office for three weeks. My editor Kelly Digges has arranged for guest columnists to step in, and you'll be hearing from one of them each Friday between now and when I get back. For now, though, I have something I need to tell you about that isn't mana, and it can't wait until I return. I hope you'll understand. Legacy in its modern form was created in September of 2004, when it received its own banned list for the first time. The first Legacy Grand Prix took place in Philadelphia in November of 2005, with 495 players in attendance. Since that first Grand Prix, Legacy has become more and more popular. Legacy Grand Prix attendance has skyrocketed, culminating last year in the 2,227-player Grand Prix Madrid, the largest tournament in Magic history. Independent tournament organizers have taken to it as well, with events like the StarCityGames.com Opens featuring the format. There are also a large amount of smaller Legacy tournaments run at stores around the world. It's clear that Legacy has hit a nerve with the Magic-playing public. A long time ago, we promised not to reprint a certain list of cards. Some of those cards have become important parts of tournament Legacy. Although we regret that promise now, it is a promise that we made, and we intend to keep it. Much of the appeal of Legacy is that the format does not rotate. However, as Legacy becomes more and more popular, the relative supply of these cards as compared to the size of the audience that wants to play with them is only going down. This makes the format less and less accessible to new entrants over time. Many of you have recognized this, and called for a non-rotating format that does not contain these cards. Last Thursday, we announced the formats for the 2011 Magic Online Community Cup. Here's a quote from the announcement. Hosted at our Renton headquarters from June 15 through June 17, the 2011 Community Cup will feature three exciting formats: Scars of Mirrodin block draft, Standard, and Modern. Both Constructed formats will use "Unified" deck construction rules. Standard, the most popular Constructed format, includes cards from Zendikar block, Scars of Mirrodin block, and Magic 2011. As I said, many of you have called for a non-rotating format that doesn't have the card availability problems of Legacy. We propose Modern as that format. This represents only a proposal and an experiment. Self-contained events like the Community Cup are a perfect way for us to get data about potential new formats; by running Modern at the Community Cup, we will be able to get some data about what the format looks like, and we will be able to judge what you, the public, think about it. For now, that is our only goal. Some of you have speculated about what we plan to do with the format, and have wondered in various forums whether it may be a replacement for some other format we currently support. We haven't gotten that far. We could just add this to our stable of formats, as it fills a role that no other format does. I don't think any of us know what, if anything, will happen in the future with it. However, although this is only an experiment, we put a lot of thought into the decisions we made about the format. Of all the potential non-rotating formats we could have chosen, we like this one the best. Why Did We Start With Eighth Edition? Every non-rotating format needs a starting point. Legacy chooses the simplest one possible: the first Magic set. Modern does not have the same luxury. We had to choose a place to begin, and the choice was not immediately obvious. We could have chosen any number of different starting points. Mercadian Masques block, Invasion block, and Ravnica block were all floated, and each one had good points and bad points. However, they each shared one common problem, which was that they felt completely arbitrary. Why would we choose any of these points over the others? Everyone had reasons, but they weren't reasons that were satisfying to people who had a more holistic perspective. To those people, every starting point looked equally random. This all changed when Aaron Forsythe suggested that we begin at the change to the current card frame, which was first used in Eighth Edition Like every other choice, this was arbitrary, but it provided two things the others didn't: it began at a a major change to the way we made Magic cards, and it gave us a visual marker that can be used to tell whether a set is legal or not. We understand that this choice is secretly as arbitrary as any other. If you're reading this, and you care about Modern, you probably know the order that Magic sets came out in by heart. If that's true, you are in the statistical minority. Most Magic players don't, and we don't want them to have to know in order to guess whether a particular card is legal. Legacy card legality is very simple to check. Is it a Magic card that doesn't appear on a fairly short banned list? If so, then it's legal. Despite the "new card frame" heuristic, Modern could never be that simple, as that test sometimes provides a false positive. You couldn't, for example, play your Wild Mongrel from Duel Decks: Garruk vs. Liliana in Modern, despite it being printed in the new card frame. We are okay with that, for three reasons. First, the "new card frame" test would produce a correct result on over 99.99% of printed Magic cards. It is unfortunate that there are exceptions, but the great majority of all Magic cards were opened in (non-Time Spiral) booster packs, and therefore would react correctly to the test. Second, a card randomly being printed in an ancillary product and therefore becoming legal in Modern would be confusing to many players. For every Garruk vs. LilianaWild Mongrel in the world, there are thousands of OdysseyWild Mongrels that would then be able to show up in Modern decks and confuse players who weren't paying close attention. 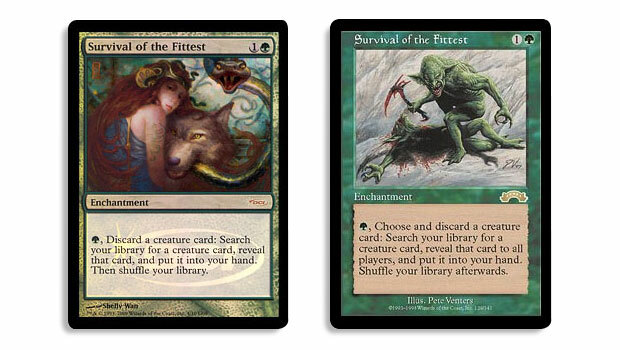 Even worse would be allowing something like Survival of the Fittest to become legal in Modern when we release a promotional version of it through the judge program, as many players pay no attention to these releases. We think this would have been very confusing in the long run. Third, monitoring ancillary products for Modern legality would be a nightmare. First, we have already printed cards in ancillary products that would have serious implications on the format. For example, Daze and Fireblast are both in Duel Decks: Jace vs. Chandra. Do we want these cards in Modern? Maybe they would be okay, but maybe they would make the format less fun. Also, when we make ancillary products like Magic: The Gathering Commander, we want them to be the best they can be. If every card in those products were legalized in Modern, Development would need the ability to either veto or ban cards that those products wanted but that didn't fit into Modern. That would get messy, and we chose not to open that possibility. Although we would still print cards that aren't legal in Modern in new frames in ancillary products, those cards would not become legal in Modern unless they also printed in a later booster release. How Did We Choose the Banned List? In order to determine a banned list, all six developers and both development interns talked a lot about what the format looked like. I'll go down the list card-by-card and explain our choices. Ravager Affinity was one of the most powerful Standard decks of all time. Although Arcbound Ravager and Disciple of the Vault were the stars of the deck, it could not have existed without the artifact lands, which gave them tons of free fuel. While Scars of Mirrodin does not use the affinity mechanic, artifact lands combine just as powerfully with metalcraft, and we would prefer to ban the piece of the puzzle that breaks in both contexts. I've read people suggest that we could have just banned Arcbound Ravager, Disciple of the Vault, or both, instead of the five artifact lands. We do not believe this to be the case. Have a look at this deck, which recently won a StarCityGames.com Legacy open. The only cards in this deck that aren't in Modern-legal sets are three Diabolic Edicts in the sideboard, which are easily replaceable. If artifact lands and Scars of Mirrodin cards combine powerfully enough to win a Legacy tournament without Arcbound Ravager or Disciple of the Vault, then there's no way we could keep all of them around in Modern. We left Darksteel Citadel legal to give deckbuilders one artifact land to play with, but the rest of them had to go. Chrome Mox is an extremely powerful fast-mana card. Some of the most powerful starts in the Extended format that began with Mirrodin involved a first-turn Chrome Mox into Dark Confidant or Bitterblossom, and these starts could be extremely difficult to come back from. Furthermore, Chrome Mox would likely be an important piece of acceleration for any degenerate combination decks. We felt that Chrome Mox would add too much speed to the format, as well as make opening hands matter too much. Dark Depths and Vampire Hexmage combine to give you a 20/20 creature for only two mana. In the Mirrodin-forward Extended format, those two cards were the core of one of the most dominant combination decks in recent memory. We believe that this deck would have been one of the best decks in Modern if we left it alone. Also, two mana for a 20/20 indestructible flying creature is just kind of stupid. Vampire Hexmage has fair applications, but Dark Depths has almost none. We chose to ban the more offensive of the two. Data from tournaments held in previous Extended formats showed that Sensei's Divining Top takes too long to play with. When rounds go to time, everyone in the entire tournament has less fun. If Modern ever caught on seriously, we would likely have to ban Top, so we decided to reflect that in this experiment. Skullclamp is banned in Legacy for being too powerful. Modern is a subset of the Legacy card pool, so it is only logical that we would ban Skullclamp here as well. Remember the Dark Depths / Vampire Hexmage deck from above? The other half of the deck is Sword of the Meek / Thopter Foundry, which was strong enough on its own to show up in more controlling decks that had white-blue shells. It has also seen plenty of Legacy play in Enlightened Tutor–based decks. Once again, if it was strong enough for Extended formats that looked similar to Modern and then made the transition into Legacy, we thought it would be too powerful for a healthy Modern format. Although Umezawa's Jitte is by far the most powerful Equipment in Legacy, it is not quite as game-ruiningly powerful as some of the other cards on this list. Historically, Umezawa's Jitte has been an extremely powerful card against creature decks, with mirror matches between creature decks often degenerating into battles over Jitte. Unfortunately, Stoneforge Mystic gives decks that want to fight against creature decks consistent access to Jitte and a creature to put it on. We think that Stoneforge Mystic is the more fun of the two cards, so rather than allow such a strong anti-creature-deck pressure to remain in the format, we chose to ban the real offender: Umezawa's Jitte. Dredge is a very powerful combination deck, and we wanted to ban something from it. The problem came when we were exploring potential cards to ban. If we banned Bridge From Below, players could still use Narcomoeba and Bloodghast to Dread Return enormous creatures. If we banned Narcomoeba, Bloodghast would be a bit slower, but Dread Return would still bring back enormous creatures and Bridge From Below would still make Zombies, and any future creature that comes back from the graveyard cheaply would have the potential to re-break the deck. We aren't going to stop printing cards that care about the graveyard, so attacking the deck after it has begun to dredge felt counterproductive. The real power of Dredge is that every card draw that is replaced by dredging five or six cards effectively allows the Dredge player to draw two or three cards. By that metric, Golgari Grave-Troll is the strongest "card-drawing spell" in the Dredge deck, and it doubles as a win condition. Therefore, it seemed like the best place to attack the deck. You can still play Dredge, but you'll be dredging a little bit slower, and you'll have to play real targets to reanimate instead of getting Golgari Grave-Troll for free. There are some very powerful cards in the format that we didn't ban. For example, Hypergenesis and Æther Vial have both been banned in Extended. This banned list is an experiment. We intend to use it at the Community Cup, but we reserve the right to change it if we decide to unleash Modern on the world at large. As with any format, there are some cards whose conspicuous absence will be felt. In particular, the Onslaught fetch lands feel like a strange omission, when the Zendikar fetch lands combined with the Ravnica dual lands will likely be important to the format's mana bases. I admit that it is strange. However, right before Zendikar released, the format contained only Onslaught fetch lands. I played many Extended tournaments with a green-blue deck that would have loved the option to find a Forest with Misty Rainforest, but I made do with Polluted Deltas, Flooded Strands, and a few Breeding Pools. For now, the lack of allied-color fetch lands would be one of the format's idiosyncrasies. There would be others that we would discover over time, and that's okay too. As I said above, we have as yet made no decisions about whether to proceed with Modern, and we have not yet thought through all the implications of doing so. For now, we'd just like to know what you think about it. What do you think of Modern? It's awesome! It's good! It's okay! It's bad. It's awful! I don't have an opinion. Before reading this article, had you ever played a two-player draft format of any kind?